It’s official, Jean Paul is now the Batman and taking to the mean streets of Gotham. However, getting bored with common criminals, he starts to tweak his suit and uncovers one of Harold’s creations, the subway rocket! This new vehicle uses long abandoned Gotham City sudway roads that date back to a literal underground railroad connected throughout the city. Meanwhile the Trigger Twins come to town and join a local mob ring. Still new to the subway rocket, JPV almost gets into a head-on collision with an actual train while trying to stop the Trigger Twins from robbing a money train! 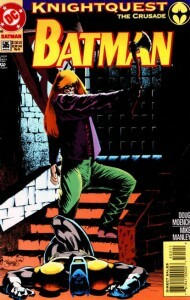 Due to his father’s condition, Tim is able to receive his license early and heads down to the batcave to pick up a car that was promised to him by Bruce. 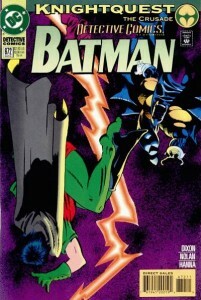 Showing up in his Robin uniform he has an altercation with Jean Paul who informs him that this Batman does not need a partner. 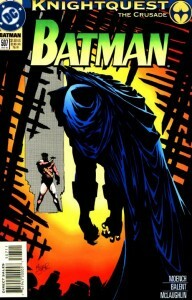 Almost strangled to death, Robin escapes Jean Paul and is locked out of the cave. After handling some routing street crime, Batman sees a building with isolation chambers and decides to try one out, wondering if it may help him discover more about himself. Across town the Tally Man is collecting life debts. One of his trails leads him to the warehouse district Batman is at and decides he may as well take out the new dark Knight as well. 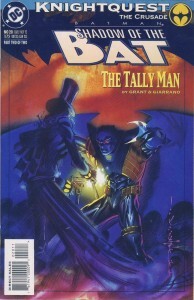 With both Batman and the Tally Man dealing with the effects of the isolation chamber, they attle their minds and each other. 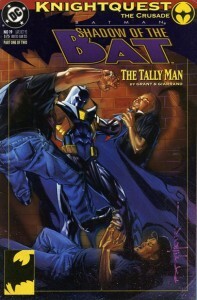 Thanks to a falling water tower and the system kicking in, Batman is able to take down the Tally Man, beating him inches away from death before leaving him for the police to take over. Batman gets a vision from St Dumas, telling him he must continue his crusade as Gotham’s dark angel. After breaking up a mob meeting, the bosses get together and hire a former government agent to down Batman. After a meeting Commissioner Gordon notices that something is very different about Batman. Batman survives his first formidable encounter and defeats both Mekros, as well as anothet hisman who was hired to take out Mekros. 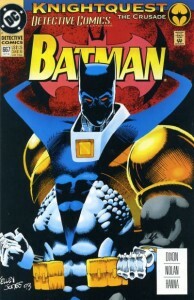 Batman goes on to form an unlikely alliance with Mayor Krol. The Trigger Twins are back again, this time they have hijacked the Public Transit Authority System’s train that collects all money from public transportation. Batman chases down the stolen train and brings them in to justice. The body of Mr. Freeze washes up on shore from his last encounter with the Joker. 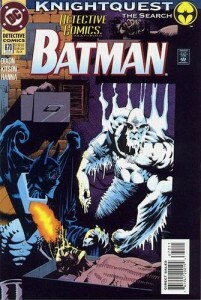 He is brought into the Gotham City morgue by Bullock and Montoya when it is thawed out, temporarily bringing Freeze back to life. 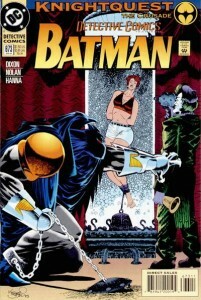 Batman and Montoya take down Freeze, but she is left shaken after witnessing the brutality of Batman. 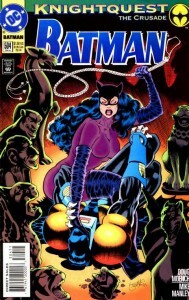 Catwoman and a group of animal rights activists set out to stop a group of corporate developers who have developed a neurotoxin to be rid of protected species. The notes for this toxin are stolen and must be acquired. 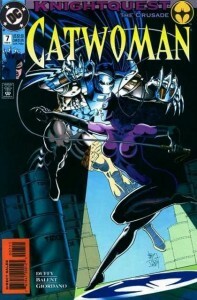 Believing that Catwoman is the thief of the Xylon-C neurotoxin, he tracks down and encounters her, only to find that she can very easily tell via pheromone that he is not the Batman she has faced all these years. While in the Batcave, Jean Paul researches her through the files Bruce kept in the batcomputer, trying to figure out why she has gone free all these years. He also wrestles with ‘thoughts’ of her. Jean Paul has another vision of St. Dumas while he chases Catwoman. 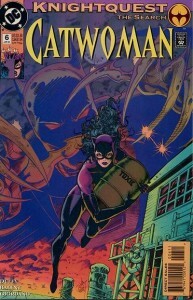 The Gotham PD find Catwoman with the canister of the Xylon-C neurotoxin, believing her to be involved in terrorism as the docks catch fire. 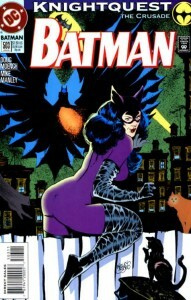 Catwoman escapes the police and displays that what she has is in fact a decor. With Batman’s help, they rescue the scientist who initially concocted the toxin and save the attendees of an international conference from being poisoned. The Joker forces Hollywood big wigs to fund his movie, ‘The Death of Batman,’ and begins to stage crimes to get footage of Batman in action. While checking on a mugging victim, Batman witnesses her falling to her demise from a window. Batman moves into save Robin who turns out to be the mugging victim he saved the previous night dressed up as Robin as part of one of his staged acts for his film. Captured by the Joker, the Gotham PD decide to step in after receiving a poster for Joker’s film in progress. 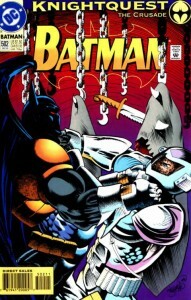 Chained into a situation he can’t quite get his way out of, Batman wrestles with himself and the demons of the system. Watching batman’s actions, the Joker is infuriated when he comes to the realization that this is not the Batman he has faced all of these years. 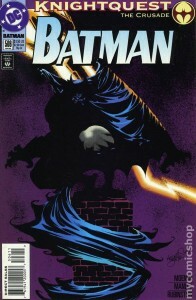 Once Batman breaks free it takes the Gotham PD to stop him from permanently taking the Joker out. 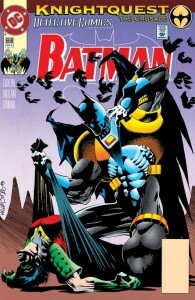 Jean Paul begins to embrace the detective side of Batman as he investigates a murder scene and begins to have a vision of St. Dumas and his father battling over the direction of his life. The murderer Abattoir kills five members of his family and is now going after his cousin and a bus full of children. This encounter sees Jean Paul redesigning his cape. While checking in on the survivors of Abattoir’s school bus attack, Batman is attacked by Lady Clayface who begrudgingly wants to kill him. 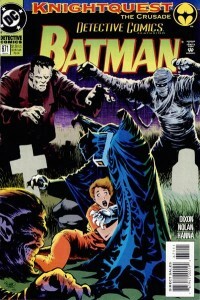 Meanwhile, Clayface III kidnaps Abattoirs cousin, Graham Etchison, who is being counseled by Leslie Thompkins. 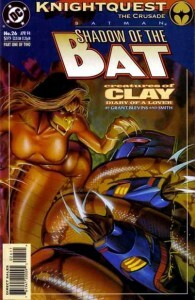 After being defeated by Batman, Lady Clayface reveals that she is only going to these measures because Abbatoir has kidnapped her and her lover’s child. 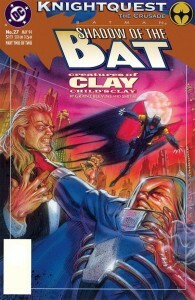 Batman instead meets at the rendezvous point to save the baby and brings Clayface III to justice. Abbatoir however escapes and straps Graham Etchison to the death machine while Batman wonders if this baby will turn out as its parents did. 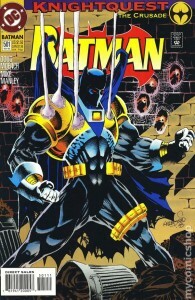 Batman joins Ballistic who comes into town under contract to kill Abbatoir. 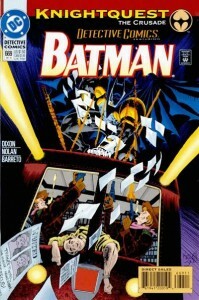 Also in town on contract to take down Abbatoir, Batman and Ballistic take down the Maniaxe in a Gotham city nightclub. After taking out the lawyer who set the contract in motion, Ballistic collects his fee and leaves town.